It will probably surprise a lot of people that the great American astronomer, astrophysicist and cosmologist, Carl Sagan, advocate of space travel and extra-terrestrial communication, visited Timothy Leary in the California Medical Facility, a state prison in Vacaville, California. 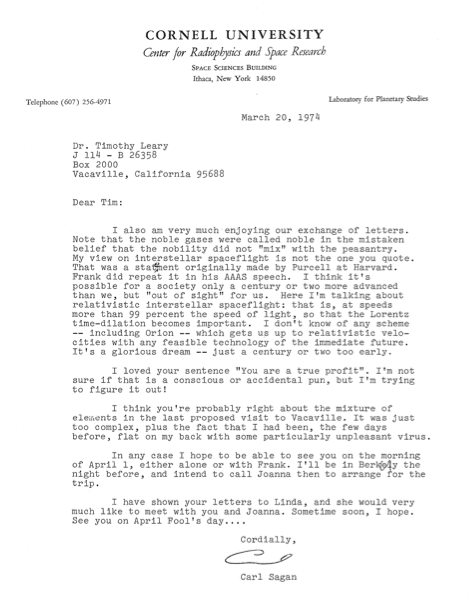 Two letters from Sagan in the Leary Archives, from February and March of 1974, confirm this. Their tone is very friendly and enthusiastic. Sagan was clearly as eager for the visit as Tim most surely would have been. Similarities between Leary and Sagan abound. They were both scientific explorers and political activists – men of ideas and action. They were geniuses at communication, not only in their books and talks, but as showmen, with extraordinary abilities for communicating their theories and beliefs to a mass audience. Tim, with psychedelic theatrical events and multimedia lecture tours in a variety of venues, and Carl, with his hugely successful television show (Cosmos) and NASA projects. They were prolific writers. 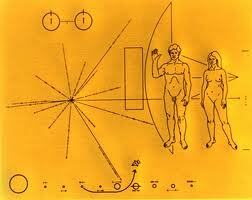 Both knew how to use the media to illuminate big ideas about inner space (Tim) and outer space (Carl). Though space travel to another galaxy is not yet possible, simply sending radio signals and actual artifacts to distant star systems is. Sagan, with Frank Drake, creator of the Drake Equation, who came along on the prison visit, pioneered SETI (Search for Extraterrestrial Intelligence). SETI was the first scientific attempt to communicate with intelligent entities in other galaxies, by sending messages via radio signals into deep space, in the hope of establishing contact. 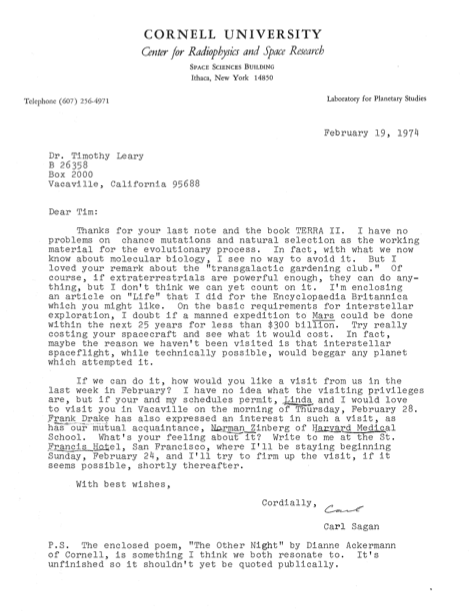 The subject that most connected them at the time of their meeting, in April 1974, was the question of whether intelligent life existing elsewhere in the universe could be contacted. Leary, a lifetime devotee of science fiction, became interested in space travel and space colonies after he was captured and returned to prison in 1973. During the first year of his new prison term, inspired by reports of the approach of Comet Kohoutek, he collaborated with two other prisoners on the book Terra II, which Joanna Harcourt-Smith Leary published privately, in January 1974. Terra II is probably one of the least known of any of Leary’s books. 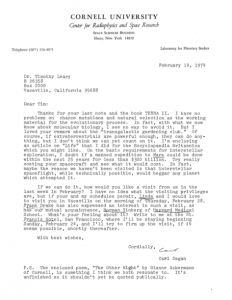 However, when Leary wrote to Sagan, and included a copy, he wrote back, enthusiastically, about an in-person visit. People with Sagan’s reputation and level of success generally avoided Tim like the plague, but Sagan took him seriously enough to come to one of the worst prisons in the country to talk to “the most dangerous man in America” (as described by President Richard Nixon in 1970). 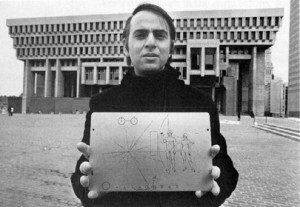 Two years earlier, Sagan sold NASA on the concept of attaching a gold-anodized aluminum plaque to the unmanned spacecraft Pioneer 10, inscribed with a message from planet Earth, describing our place in the solar system, and the form of human life that exists here. Tim expressed his excitement at Carl’s visit during a prison visit with his archivist, Michael Horowitz. He told Michael that Sagan’s gold-anodized plaque, the first man-made object to leave our solar system, was the most important message and form of media in the history of mankind. Carl Sagan holding a replica of the interstellar message, now billions of miles from Earth. 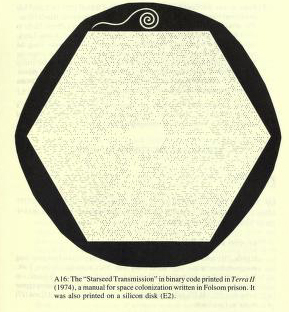 The “Starseed Transmission” in binary code, first printed in Terra II (1974), a manual for space colonization written in Folsom Prison by Tim Leary and L. Wayne Benner. In the 1960s, through his talks and books, Leary had tried to convince the government and various professional leaders of the profound evolutionary importance of consciousness-expanding drugs, which he later termed “intelligence-enhancing drugs.” Like Aldous Huxley, and others, he strongly believed that substances such as LSD represent an evolutionary leap for mankind. For Leary, “Exo-psychology” was the psychology of the future, when men and women would migrate into space. His message from 1974, through the rest of the decade, was SMI2LE, an acronym for space migration, intelligence squared, and life extension. He also adopted the idea of pan-spermia (that life on our planet was “seeded,” perhaps by intelligent life in other galaxies, or perhaps by “accident” on a comet or piece of asteroid that landed here), first theorized by the Swedish scientist, Svante Arhennius, in the first decade of the 20th century. Soon after Timothy was released from prison, he and his archivist, Michael Horowitz, brainstormed the idea of creating a television show modeled on Cosmos, with the subject being Inner Space rather than Outer Space. The theme was the discovery of psychedelic plants and drugs, and resultant brain change in the species, with Leary taking Sagan’s role as host. But it never got past the planning stage. Despite his mainstream fame, genius, and awards, Carl Sagan was open-minded about mind-expanding substances, and politically active against nuclear weapons testing. It was disclosed in a 1999 biography that he was a user of cannabis, and an advocate of its benefits, from the 1960s onward. At the time of his visit, Sagan was surely aware that Leary had been originally sent to prison for possession of less than a joint of cannabis. Sagan’s political activism was evidenced in his joining anti-nuclear and peace activists in 1986 and 1987 to protest President Reagan’s “Star Wars” (SDI) plan as destabilizing to world peace. With hundreds of others, he stormed a chain-link fence at a nuclear bomb test site in Nevada, and was arrested there on two occasions. Leary and Sagan both developed cosmologies that integrated the landscape of the mind with the journey to the stars. Both of these giants passed away in 1996, within six months of each other. Although Carl’s ashes are rumored to have been blasted into space, he chose a traditional burial in Lakeview Cemetery, in Ithaca, New York. Tim’s ashes however, were sent into space aboard a rocket (along with Gene Roddenberry’s, creator of Star Trek) that orbited for many years before burning up upon re-entry into the earth’s atmosphere. 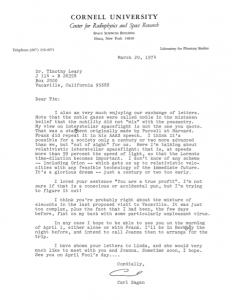 These letters can both be found in the Timothy Leary Archives at the New York Public Library, where the archives now live, and are currently being processed. Thanks for your last note and the book TERRA II. I have no problems on chance mutations and natural selection as the working material for the evolutionary process. In fact, with what we now know about molecular biology, I see no way to avoid it. But I loved your remark about the "transgalactic gardening club." Of course, if extraterrestrials are powerful enough, they can do anything, but I don't think we can yet count on it. I'm enclosing an article on "Life" that I did for the Encyclopaedia Britannica which you might like. On the basic requirements for interstellar exploration, I doubt if a manned expedition to Mars could be done within the next 25 years for less than $300 billion. Try really costing your spacecraft and see what it would cost. In fact, maybe the reason we haven't been visited is that interstellar spaceflight, while technically possible, would beggar any planet which attempted it. If we can do it, how would you like a visit from us in the last week in February? I have no idea what the visiting privileges are, but if your and my schedules permit, Linda and I would love to visit you in Vacaville on the morning of Thursday, February 28. Frank Drake has also expressed an interest in such a visit, as has our mutual acquaintance, Norman Zinberg of Harvard Medical School. What's your feeling about it? Write to me at the St. Francis Hotel, San Francisco, where I'll be staying beginning Sunday, February 24, and I'll try to firm up the visit, if it seems possible, shortly thereafter. P.S. The enclosed poem, "The Other Night" by Dianne Ackermann of Cornell, is something I think we both resonate to. It's unfinished so it shouldn't yet be quoted publically. I also am very much enjoying our exchange of letters. Note that the noble gases were called noble in the mistaken belief that the nobility did not "mix" with the peasantry. My view on interstellar spaceflight is not the one you quote. That was a statement originally made by Purcell at Harvard. Frank did repeat it in his AAAS speech. I think it's possible for a society only a century or two more advanced than we, but "out of sight" for us. Here I'm talking about relativistic interstellar spaceflight: that is, at speeds more than 99 percent the speed of light, so that the Lorentz time-dilation becomes important. I don't know of any scheme -- including Orion -- which gets us up to relativistic velocities with any feasible technology of the immediate future. It's a glorious dream -- just a century or two too early. I loved your sentence "You are a true profit". I'm not sure if that is a conscious or accidental pun, but I'm trying to figure it out! I think you're probably right about the mixture of elements in the last proposed visit to Vacaville. It was just too complex, plus the fact that I had been, the few days before, flat on my back with some particularly unpleasant virus. In any case I hope to be able to see you on the morning of April 1, either alone or with Frank. I'll be in Berkeley the night before, and intend to call Joanna then to arrange for the trip. I have shown your letters to Linda, and she would very much like to meet with you and Joanna. Sometime soon, I hope. This entry was written by lisa, posted on October 15, 2012 at 4:02 am, filed under California Medical Facility in Vacaville, History, Letters and tagged Carl Sagan, Comet Kohoutek, exo-psychology, Golden Recording, Intelligence Enhancing Drugs, Pioneer 10, SETI, Terra II, Voyager 1. Bookmark the permalink. Follow any comments here with the RSS feed for this post. Post a comment or leave a trackback: Trackback URL.